Eggnog was a southern tradition for Christmas and New Year's Eve. In the following story, a tub of egg nog was set out on the porch for 12 days - from Christmas until Twelfth-night (January 6) - for visitors. Mrs. B.C. Howard's recipe for Egg Nogg from her Fifty Years in a Maryland Kitchen is below. As they went down the hill to the Smithsonian [museum, Washington, D.C.], Mrs. Gray turned a little aside to show Patty something in which she took an interest. They passed a small wooden house, with a wide, friendly-looking stoop. On each side the stoop, or porch, was a broad seat. A large tub stood on the porch, and on one of the seats were several clean mugs and a plated ladle. The tub looked as if it were filled with soft custard. "I never thought I should see that again," said Mrs. Gray, surprised. "What is it, mamma?" said Patty, drawing near, and peering into the tub. "It is egg-nog," said her mother; "the Christmas holidays are not over. 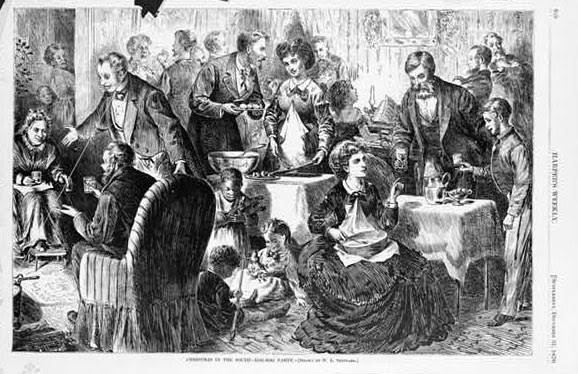 Thirty years ago, [1840s in Baltimore] all the rich people kept egg-nog and plum-cake standing in their parlors till Twelfth-night was over; and Catholics of the middle class always set out a tub of egg-nog. They had no time nor room for their guests within doors." "But, mamma," said Patty, "didn't anybody steal it, and didn't the dogs get in?" "I ought to be able to tell you," said Mrs. Gray, laughing, "but I can't. It stood out, and I think there was generally a child to watch it." "May we taste?" said Patty. Mrs. Gray took the ladle, and put about a teaspoonful into a mug. Patty and Willie just touched their lips to it; but it was too strong. It seemed to be full of brandy. A pail of clean water stood near, and Mrs. Gray put the mug into it. "That used to be the rule," said she. When they came back, a few minutes after, they saw a little girl wipe the mug with a clean towel, and set it back on the bench. Patty Gray’s Journey from Baltimore to Washington by Caroline Wells Healey Dall (1822 Boston - 1912 DC; she moved to Baltimore in 1844 when she married Rev. Charles Dall) Boston: 1869. Beat the yolks of twelve eggs, and the whites of two as light as possible. 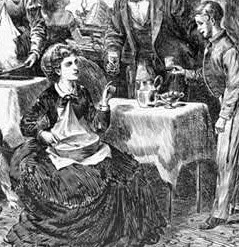 Allow an even table-spoonful of pounded sugar to each egg, pour slowly into the above one pint [2C] of brandy, and quarter of a pint [1/2C] of peach brandy, stirring rapidly. When well mixed, add three pints [6C] of new milk, and four pints [8C] of cream. No liquor must be added after the cream and milk, or the egg nogg will be thin and poor. The peach brandy may be omitted, if desired. NOTE: This recipe makes a light drink with a whipped top... a 1/6 portion made 5-6 cups. It is very nice, not as strong or thick as some. To be safe, buy pasteurized eggs in a 'milk' carton from the store or fresh from the local farm and wash the shells. Photograph is of Howard's eggnog recipe. I no longer have a punch bowl and cups so used a taller colorful glass. Some syllabubs included egg whites with the cream or milk. 1696 Syllabub from The Accomplished ladies rich closet of rarities by J.S. To make a whipp'd Syllabub. Take a pint of Cream, six spoonfuls of Sack, the Whites of two Eggs, two ounces of fine Sugar, and with Birch-twigs, beat it till it froth well; scum it [as it froths, remove top layer of the froth] and put it into your Syllabub-pot.